Bhuwan KC is special in Karishma KC’s filmy career because he was the lead actor, opposite to her, in her debut movie ‘Santan’. The success of the movie helped Karishma to be known as an actress. Later, Karishma was also the lead actress in Bhuwan KC’s film ‘Sapana’. She also acted opposite to Bhuwan KC in a number films like ‘Sauta’. 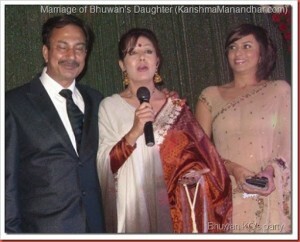 Here are some of her photos of Karishma with Bhuwan KC. The first photo is taken in a program in which Karishma showcased her tatoo on her breast for the first time by wearing a low-cut green dress.